There is always a good reason to visit Scotland's largest city, whatever the season. You may simply want to take a few days to stroll in the parks and take in the sights and sounds of the city or perhaps you are eager to explore the many architectural delights imagined by Charles Rennie Mackintosh. Why not plan your visit during one of the many festivals that take place throughout the year or come to Glasgow to sample some of the nightlife that the city has to offer. Glasgow has always been a popular destination short breaks, especially for Winter Breaks and Easter Breaks, since there is so much to do - no matter the weather! There are a number of festivals which attract visitors to Glasgow at different times of the year. The Aye Write! Book Festival in March is a treasure trove for lovers of literature. Also in March is the Glasgow International Comedy Festival, which is always good for a laugh or ten. For music lovers there is the World Pipe Band Championships which are held annually in August or the Glasgow Jazz Festival at the beginning of summer. And more recently, Glasgow has developed a tremendous reputation for relaxing spa breaks, as well as theatre breaks for lovers of culture. Many visitors take a city break in Glasgow to follow the trail of Scotland's best-loved architect, Charles Rennie Mackintosh. From the Scotland Street School Museum to the Willow Tearooms and the House For an Art Lover in Bellahouston Park, a few short days is hardly enough to take it all in. There are plenty of family entertainment options for a weekend break in Glasgow, too. The IMAX cinema at the Science Centre is an amazing cinematic experience, and the Science Centre itself is full of interactive fun. Take to the slopes at the Sno!Zone at the Xscape adventure centre or simply enjoy a more sedate game of bowling. The Sandyford Hotel is an ideal choice for breaks in Glasgow. Centrally located between the West End and the City Centre, we are a family-run 3* hotel, offering 55 tasteful and well-appointed bedrooms, all with en suite bath or shower facilities and complimentary tea and coffee. We have 24 hour reception services and our cheap B&B accommodation prices include a full Scottish breakfast. 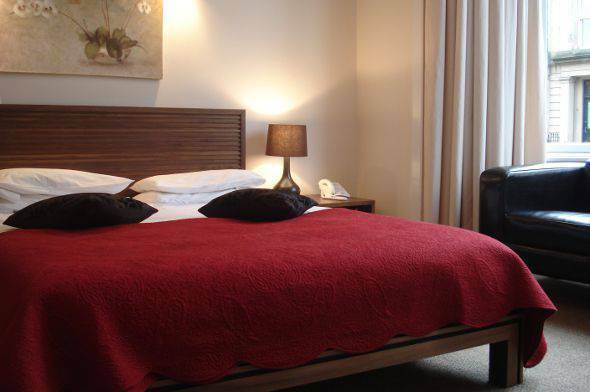 If you need affordable quality bed and breakfast accommodation for a Glasgow break, call The Sandyford Hotel on (+44) 0141 334 0000 where we will be delighted to advise you on available rooms for your dates. You can also contact the hotel through the online booking form on this website. Make The Sandyford Hotel your first choice of accommodation for breaks in Glasgow.